Spray 3 1/2- to 4-quart slow cooker with cooking spray. Trim and discard excess fat and silver skin from beef roast; cut beef roast into 3 or 4 large pieces. Place in slow cooker. In medium bowl, mix broth, soy sauce, brown sugar, Sriracha sauce, sesame oil and pepper. Add white onion chunks to slow cooker; pour broth mixture over beef and onions. Cover; cook on Low heat setting 7 to 8 hours or until beef is tender. Remove beef to cutting board; cool slightly, and shred into large pieces with fork. Meanwhile, in small bowl, beat cornstarch and rice vinegar with whisk until smooth. Increase to High heat setting; beat in cornstarch mixture with whisk until completely blended. 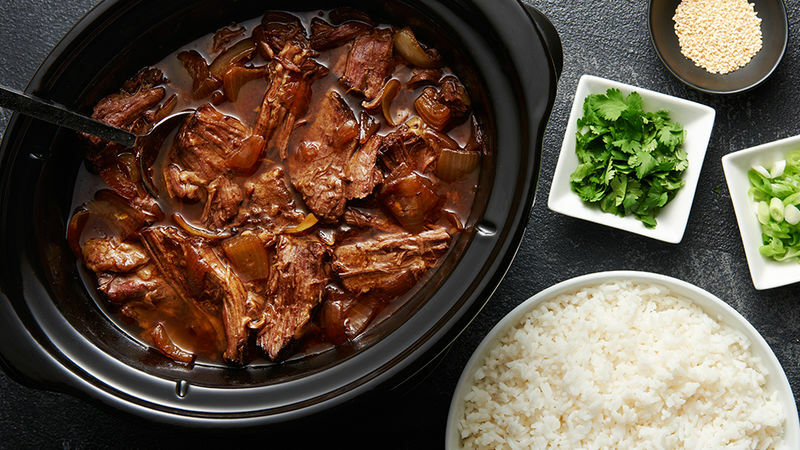 Return beef to slow cooker; cover and cook about 30 minutes or until sauce is thickened. Spoon beef, white onions and sauce over rice; top with green onions, cilantro and sesame seed. Trimming the beef roast of excess fat provides a desirable consistency of the thickened sauce without needing to skim off the fat. Reduced-sodium soy sauce may be substituted for soy sauce in this recipe, if desired. To toast sesame seed, sprinkle in ungreased heavy skillet. Cook over medium-low heat 5 to 7 minutes, stirring frequently until browning begins, then stirring constantly until golden brown.